Today's card has the same sentiment as yesterday's card because I cannot get this song out of my head. For all of the lyrics, a history of the song and a link to where you can hear it on YouTube, please click here. I do hope you will check out this song because it is so very powerful. 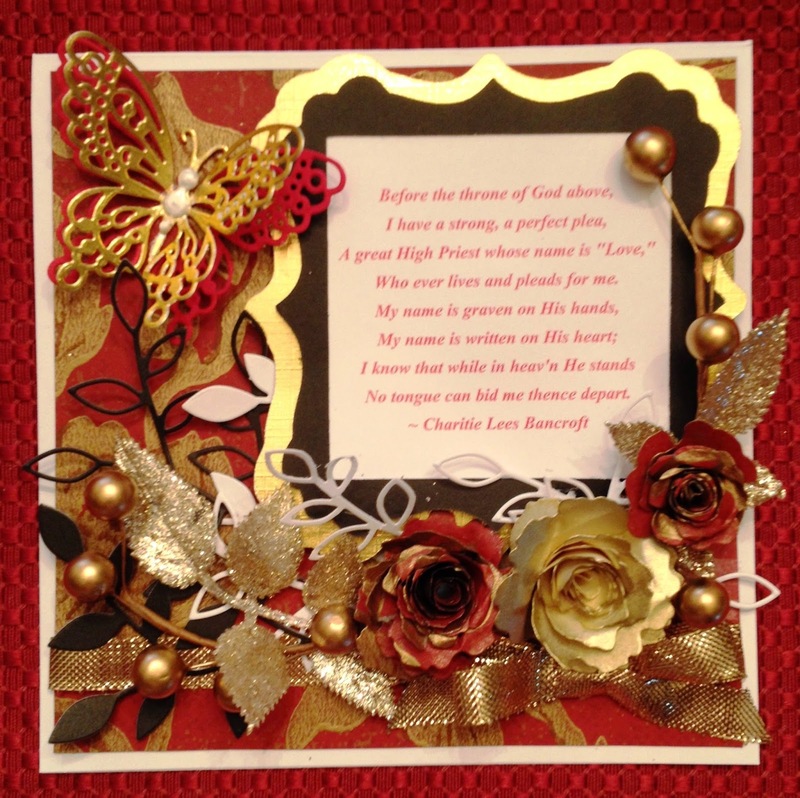 This is another entry to the challenge at Joan's Touch featuring a die, the color black, some sort of embellishment and at least one item that may be purchased at Joan's Gardens. A two-layered black and gold frame were mounted around the sentiment and set on the gold and red background with pop dots. Two of the roses were cut from the background paper and one was cut from white cardstock which was spray painted gold. The Lorelai leaves were set in along with some gold leaf and berry embellishments in my stash drawer. A gold bow and ribbon are run across the bottom. The Monarch Butterfly die (got it from Terri at Joan's Gardens recently, and it is a big favorite of mine now!) is layered with red and gold paper with white Ranger Liquid Pearl dots on the body. Ginny, another pretty card,. I love all the embellishments and your butterfly looks great. Thanks for joining us again for this challenge. Absolutely gorgeous Ginny! LOVE those flowers, your design and of course that fabulous double butterfly! AWESOME!! Thanks so much for playing in our ‘MAY FLOWERS’ challenge at Dies R Us! Please come back again soon! Elegant and GORGEOUS!!! Love the gold butterfly and all the pretty flowers!!! Thank you for joining us at "Dies R Us" for the "May Flowers" challenge!! Ginny your card is so pretty with such a lot of gorgeous elements to look at. I love the differently made flowers. Welcome to my butterfly challenge. Thank you for fluttering by. Hugs Mrs A. (Butterfly challenge). beautiful creation. those colours are stunning together & your attention to detail is great. its no wonder you had to make the card larger to fit everything on! Ginny your card is amazing! I love the colors of red, gold, and black you used. Beautiful! That is a wonderful sentiment.